You might remember I'm taking part in a Scunci Hair Accessories challenge, where each week for 4 weeks they will send me one of their accessories and I need to create a look with it. Click HERE for week 1 look. This week's accessory is the Upzing, which retails for $12.95aud and comes in various sizes and styles. Check out Priceline, Target, Big W, etc. 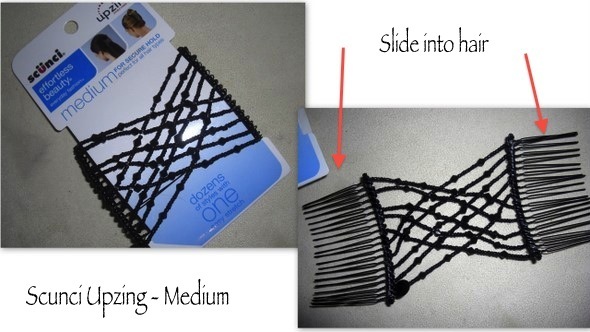 I'd seen this on some girls' hair previously but had no idea how the work. It looked wayyy too complicated with those intercrossing beads. But I'm happy to tell you they are not complicated to use at all! Here are the instructions on the back of the pack. For a great demo of it in action check out Mez's blog and video HERE. And how did I wear it? 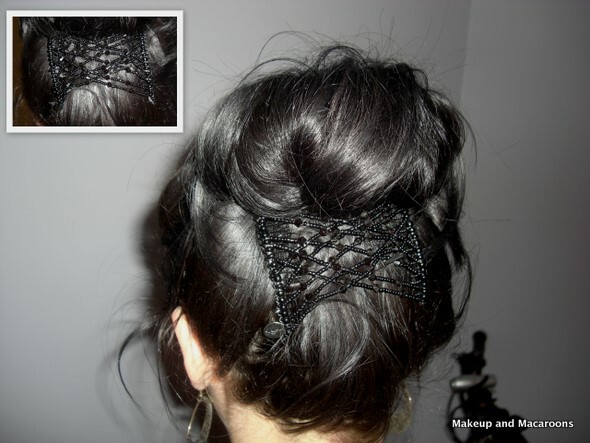 I put my hair up in a bun first, then used the Upxing to hold the stray shorter hairs in place and add a bit of interest to the boring bun. Of course if your hair is long enough you can be more creative with the upzing, but on my shoulder length hair this is the best I could do. I asked my husband to take these photos. He's so used to me blogging now, that he doesn't think it's weird when I ask him questions like "Can you take a photo of the back of my head?" Instead he takes the photos, while probably rolling his eyes on the inside. Have any of you tried the Upzing? What are some of your favourite ways to do your hair? That think looks very intimidating! It looks like a cool little product though. I may look into it when my hair gets a little longer. My husband has gotten used to it as well. At first he looked at me strange when I photographed makeup but he eventually just accepted it. I like this as an accent piece! It's very pretty. I find these surprisingly comfortable. I love the way you used yours. Lilit, that looks INCREDIBLE! It's so gorgeous! LOVE IT! this looks great with your hair. great blog. You are killing me with these hair challenges...I want this one too!